Walter Harrison's Nyger Seed (also known as Thistle Seed) is a small oil rich seed packed with energy. 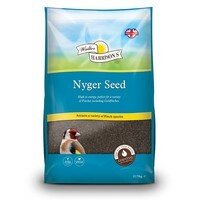 Suitable for all year round feeding, Nyger Seed is popular with colourful varieties of garden bird and will help to attract them to your garden; especially Goldfinches, Greenfinches, Chaffinches and Siskins. Due to the small size of Nyger Seed only a specialist Nyger Seed Feeder is recommended. Great value product. The Goldfinch especially love this. Feeder needs filling more often due to high demand from my little friends!